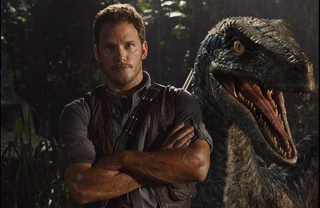 The first actual scene from Jurassic World has come to us from MTV, and there's a fair amount of information in it. Not the least of which is that Chris Pratt is still a special brand of bro-y and charming even as he flirts with Bryce Dallas Howard's character. Spoilers of a sort ahead. Other things we learn in the clip: Pratt's in danger because he's brought on board to make sure the enclosure for the new dinosaur that the park's made is safe. I'm guessing it is not. We also learn that these two characters have a romantic history. And, as suspected, he totally has some tame velociraptor friends.